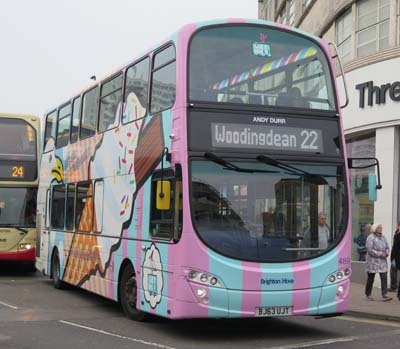 Connections with Brighton and Hove : Andy Durr left a lasting legacy to Brighton which few councillors will ever surpass. He had the idea of revitalising the seafront between the piers when it had become very down at heel. Brighton Council restored the Lower Esplanade, improved some arches and created quarters for the arts and fishing. Private enterprise then had the confidence to invest millions of pounds in clubs, shops and restaurants. 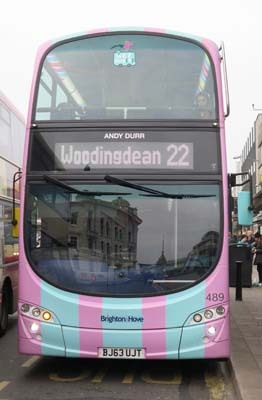 The work took place in the 1990s with Andy Durr dubbed Mr Seafront. 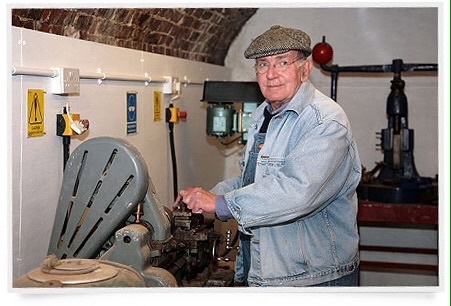 He also founded the fishing museum and was a leading member of the West Pier Trust. He was a lecturer at Brighton University when he became a Labour councillor. In 2000 he became Mayor and welcomed the Queen to the Royal Pavilion. But he far preferred being on the seafront wearing his trademark denim dungarees and watching the world go by. A keen trades unionist, Andy Durr was also a freemason. He wrote several histories of radical movements. He died in December 2014 and is fondly remembered both by friends and by political opponents. 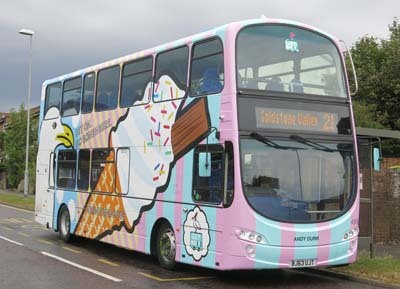 489 Volvo Gemini - carried name since July 2015. 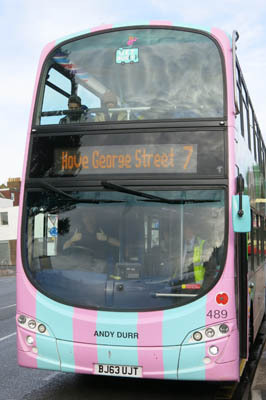 Name moved on bus and Brighton & Hove added December 2016.